5/8/12. 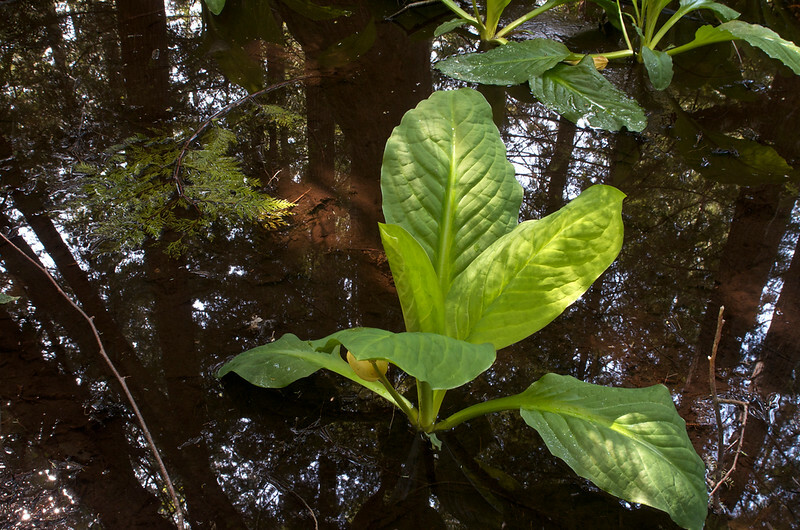 Skunk cabbage (Lysichiton americanum) in a wooden glen, Sechelt Pennisula BC. If you have ever come across this wetland plant, you would be immediately struck by its slightly offensive odor somewhat reminiscent of skunks. It has a beautiful "cup like" yellow flower that is designed to trap insects ( you can barely see it under the leaf). The leaves were used as "wax paper" by the Haida to line baskets but the plant is otherwise inedible due to mild toxicity from calcium oxalate crystals, but was eaten during times of famine. Extended boiling of the plant leaves would eventually reduce the toxicity. Very informative photo! I'd love to see the cup-like flower, too.